SCENAR history, 1988 — SCENAR and COSMODIC — “LET Medical” Research Lab. Back in Krasnodar times Alexander Karasev started mountain climbing (the Caucasus was nearby). He could not pass over his fellow climbers. Frostbites, hypoxia, ultraviolet burns or any disease in the mountains can be a catastrophe. 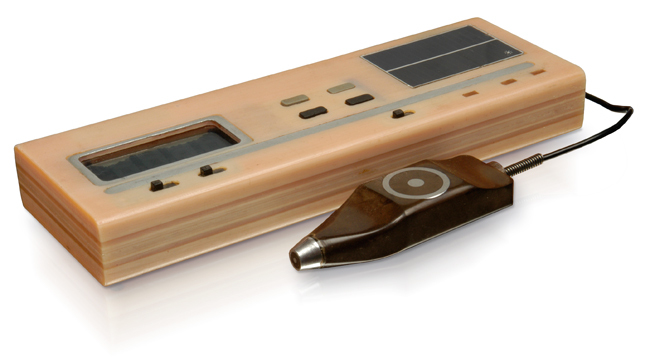 Specially for them, he made one and only device — SCENAR T4-01 “Lhotse” powered by solar battery. This is the first device which was taken to the mountains and was used during expedition to Lhotse (Nepal). Even the casing was made by Alexander Karasev himself on the milling machine. Casing was milled out of one solid piece of vinyl plastic and sealed up. This device had only remote electrode. Energy regulation: digital, multistep, with “up” and “down” buttons. Button for switching the “depth”, button for switching the frequency. Three LEDs displayed energy, frequency, and battery charging status. Plus LCD indicator — it showed energy and expert evaluation. Power supply: built-in accumulator charging from the solar battery.